A bureaucratic blunder has left Wales off a map of Europe on the cover of a prestigious EU reference book. 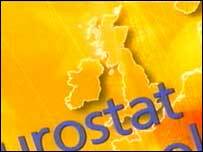 The Eurostat Statistical Compendium has all the facts and figures on Europe. All EU member states, and the rest of Britain, are accurately represented on the cover - but Wales has disappeared and been replaced by the Irish Sea. A line was drawn from Chester to the Severn Estuary, roughly along the English border, but to the west there is nothing until the Irish coast. Welsh First Minister Rhodri Morgan laughed it off, describing it as a "computer-generated image that has clearly gone wrong." Mr Morgan - who headed the European Commission office in Wales in the 1980s - said: "Are we somehow going to refuse to accept Objective One money from Europe because of this terrible slight on Wales? "I don't think we're actually going to do that. It's the way we use European money that's important. "We've made a great success of that." Tory leader Michael Howard referred to the omission in his speech to the annual party conference in Bournemouth. Mr Howard said: "I was born and grew up in south Wales. As you may have heard, we've just been left off the new EU map. "I know I've had my differences with Brussels, but I really do think that is going too far." Labour Wales MEP Glenys Kinnock told BBC Radio Wales that she could laugh about the oversight but had already asked for information on how it had happened. She said: "It's quite a shocking omission to airbrush Wales off the map. "The reality is that Wales is on all the maps that matter, in terms of getting substantial amounts of structural funds and so on. "And we're certainly not a part of Europe which is forgotten by the European Commission - apart from this extraordinary map," said Mrs Kinnock, whose husband Neil, the former Labour leader, is the outgoing vice-president of the EC. Plaid Cymru MEP Jill Evans said: "I am writing to Eurostat to ask for an explanation about how this could have happened. Whilst this is most likely down to a mistake or an oversight, it is nonetheless more than a bit annoying. "I'm sure that some people will find this quite amusing, but there is a serious side. "Let's not forget that Eurostat does a very important job collating and analysing all sorts of data across Europe - this data forms the basis of preparing European law and deciding on developing funding programmes, for example. "We work hard to put Wales on the map so this kind of thing is not what we want to happen. Personally, I can't help wondering that if Wales was a full member state in its own right then oversights like this would be much less likely." Lembit Öpik, leader of the Welsh Liberal Democrats, called it an amazing blunder. "Imagine if England or Belgium were left off the map," said Mr Öpik, MP for Montgomeryshire. "Mistakes like this make it more difficult for pro-Europeans like me to convince people of the benefits of a united Europe. "It's a genuine error but in the current political climate the European Union really should be aware that a mistake like this is a monumental gift to Eurosceptics." But the UK Independence Party (Ukip), which wants Britain to pull out of the EU, welcomed the removal of Wales. "We're pleased the EU has recognised our wish to withdraw the UK, but we didn't expect them to do it one bit at a time," said Ukip spokesman Quentin Williamson. "While Wales might be lucky enough to be the first part to leave the EU, we want the rest to leave at the same time." Eurostat spokesman Tim Allen said it was looking into the mistake in the guide, which costs 50 euros (£34.44). 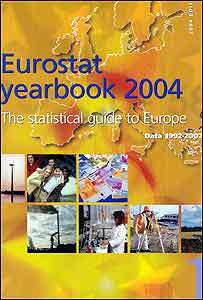 On its website, Eurostat describes its guide as an "essential product"
"All I can tell you is this certainly wasn't deliberate." He went on: "The map didn't come from us. The current yearbook was laid out by contractors working for the EU's publications office and we have no idea where they took their illustration from. "Quite frankly I don't know how you go about finding a map of Europe without Wales on it. "We have requested an explanation about why and how this happened." No-one in the Eurostat office spotted the error when the yearbook came back from the printers. But squinting at it, Mr Allen agreed that, although the map imagery looked "impressionistic", there was no evidence that the details had been squeezed or modified for artistic purposes. Such deeds have happened in the past in efforts to fit artwork of the EU landmass on to documents and coins. But Mr Allen was adamant that there was no deliberate or reckless attempt to streamline the UK on aesthetic or practical grounds at the expense of Wales. He said bits of Scandinavia looked a bit blunted on the map. "I don't think there are any fjords, for instance, and some of the Mediterranean islands are probably missing, although I must admit the whole of Ireland is there." Meanwhile, Eurostat staff have been checking other documents. "We've got a yearbook of regional statistics coming out later this week. It's full of maps of the regions and I can tell you that Wales is definitely included," said Mr Allen.